In October, 2008, at the same time we also moved our "reefer" car, the BBCRC brought an historic 1919 Sacramento Northern wooden boxcar to Black Butte. The car was in good overall shape, particularly the interior. Here are photos and a description of the move. Sacramento Northern boxcar #2349 was built in late 1919 by the Mount Vernon Car Manufacturing Company in Mount Vernon, Illinois as one of a 25-car (originally numbered #2129-2153) order for the Sacramento Northern. 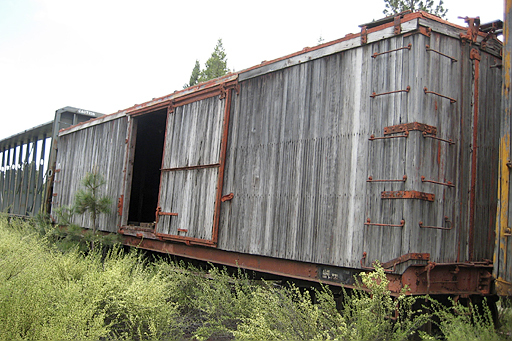 It is of a similar style to other Mount Vernon boxcars delivered to the Western Pacific in 1918-1919. It was delivered to the Sacramento Northern Railroad in January, 1920 and numbered #2150. It was "retired" in 1947 but not scrapped. The next year it was restored to service with AB brakes, and renumbered 2349 (part of SNRY 2329-2350). In 1954 it was converted to a maintenance of way (MOW) car and renumbered MW90. It was then retired in March, 1974 and sold to Tracy Railcar. It was resold to "The Factory", a boutique development in Alameda circa 1974/75. When "The Factory" failed about 1979, the car was apparently sold to a railfan who moved it first to Santa Rosa and then on to the property of the McCloud River Railroad. The owner had hoped to donate the car to a non-profit organization and at one time the MCRR had considered forming a non-profit branch. However, this did not happen and the car was eventually donated to the Heritage Junction Museum in McCloud. For many years the car sat in the "runaround track" yard east of McCloud. Together with our reefer, it was on used on occasional steam photo freight excursions. 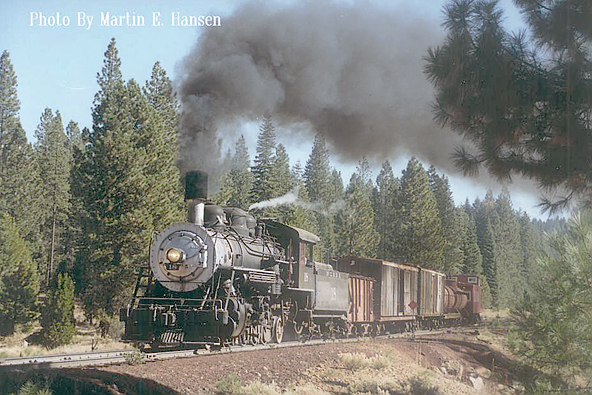 McCloud Railway in 2002. Photo by Martin Hansen, used by permission. As with our reefer, the BBCRC intends to preserve and enhance the historic character of the boxcar while converting its interior into a functional space. Rather than trying to create an "as new" museum style restoration, BBCRC members decided to preserve the natural weathered look of the car exterior — making some minor repairs and adding coats of penetrating non-toxic oil to help preserve the wood, strengthening the doors, and adding a stairway. Some of the interior wood racks were removed to open up the space and electrical outlets and lights were added. An old railroad desk came with the car and is being restored. 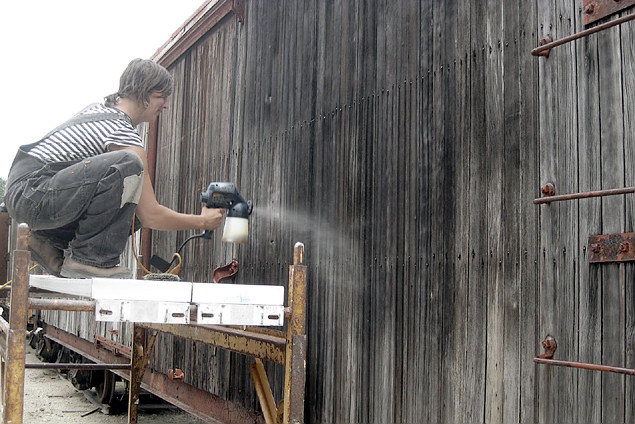 In order to protect the wood exterior of our boxcar and reefer, BBCRC volunteers sprayed a protective penetrating oil on the car exteriors. One end of the car is evolving as a project space — a place where visitors can read, write, or work on art or other projects. We're connected — wireless internet reaches here from the BBCRC office. The north end has turned out to be an excellent place for music shows as the all-wood interior provides for unexpectedly good acoustics — and everyone seems to like playing or listening to music in a boxcar!. The initiation of this performance space at our May, 2009 work party weekend, ended up being more popular than we could have imagined and has led to a whole series of traveling bands coming through and using the space — something that we hope will be an ongoing feature of our project. Let us know if you want to have a show — but keep in mind we are mainly a seasonal operation. And please see our "Helping Out" page if you can possibly help out with some funds to support the ongoing restoration work and outfitting of this car. 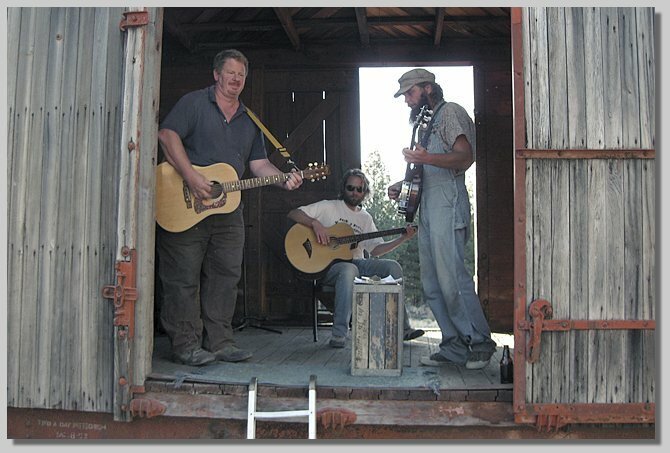 Weed-based band "Fat Sack of Bluegrass" playing at our Boxcar Warming Party fundraiser in October, 2008.